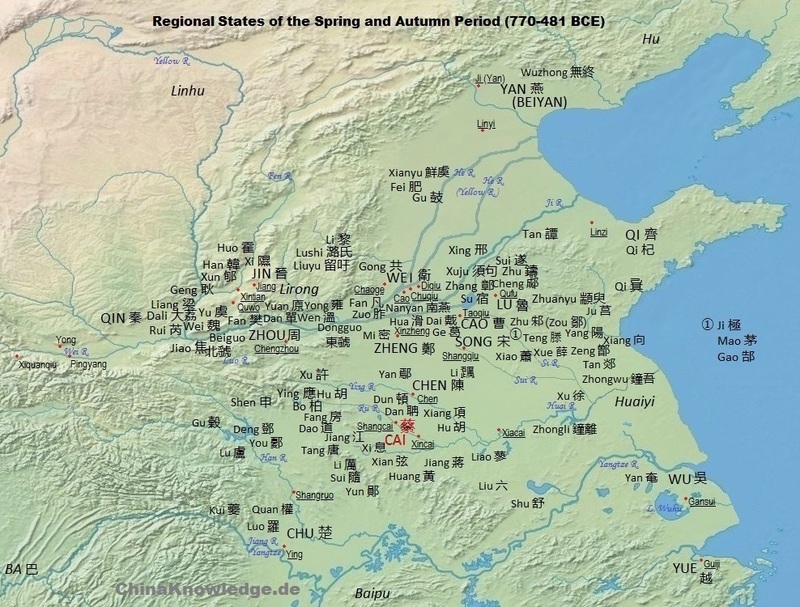 The state of Cai 蔡 was a regional state of the Zhou period 周 (11th cent.-221 BCE). As a small state of the Central Plain, it had always to cope with the ambitions of the larger states of the south. Map according to Tan Qixiang 谭其骧 (1987), Zhongguo lishi ditu ji 中国历史地图集. Cai was located in the upper Huai River and was conquered by the southern state of Chu which expanded north- and eastwards in the fifth century BCE. Click to enlarge. The first nobleman entrusted as regional ruler (zhuhou 諸侯) of Cai was Cai Shu Du 蔡叔度, a brother of King Wu of Zhou 周武王 (11th cent. ), the founder of the Zhou dynasty. When the Duke of Zhou 周公旦 took over regency for young king Cheng 周成王, Cai Shu Du doubted the Duke's sincerity and called him a usurper. The Duke defeated Cai Shu Du in battle and sent him into exile. Cai Shu Du's son Hu 胡, posthumously known as Cai Zhong 蔡仲, from the beginning declared his loyalty to the Duke of Zhou and was appointed minister of Lu 魯, the Duke's state, and later made regional ruler of the territory originally bestowed to his father, the state of Cai. In the history book Shiji 史記, the dukes of Cai are called "marquesses" (hou 侯). During the reign of Duke Ai 蔡哀公 (r. 694-675), a princess of the small state of Xi 息 passed the court of Cai on her way to marry the duke of Chen 陳. Marquis Ai did not treat her with proper courteousness, and the Marquis of Xi therefore asked the king of Chu 楚 to attack Cai. Duke Ai was captured and kept in custody until his death nine years later. His son, Duke Mu 蔡穆公 (also called Duke Miu 蔡繆公, r. 674-645), had a sister married to Duke Huan of Qi 齊桓公 (r. 685-643), the first of the hegemonial rulers. When the latter was unpleased with her (there is the story of her rocking a boat against the Duke's will), he sent her back. Duke Mu thereupon gave his sister to somebody else, a step which enraged Duke Huan of Qi, so that he sent out an army, conquered Cai and arrested Duke Mu. Only when the other regional rulers apologized for the misdoings of Cai, Duke Mu was set free. Duke Jing 蔡景公 (r. 591-543) arranged a marriage of his heir apparent with a princess from Chu. The father-in-law had an affair with the girl, so that Prince Ban 般 killed his own father and mounted the throne, as Duke Ling 蔡靈公 (r. 542-531). For his patricide, Marquis Ling was, many years later, lured into a trap by King Ling of Chu 楚靈王 (r. 540-529). The king of Chu entertained him and made his guest drunk, only to massacre him and his whole retinue. Prince Qiji 棄疾 of Chu then conquered the territory of Cai, and his father made him Duke of Cai. Three years later, Prince Qiji killed the king of Chu and usurped the throne of Chu, known as King Ping of Chu 楚平王 (r. 528-516). He gave back the state of Cai to a younger son of the house of Cai, Prince Lu 廬, known as Duke Ping of Cai 蔡平公 (r. 530-522). Duke Ping was killed by Prince Dongguo 東國, a grandson of Duke Ling. He is known in history books as Duke Dao 蔡悼公 (r. 521-519). During the reign of Duke Zhao 蔡昭公 (r. 518-491), a visit to the king of Chu brought new disaster. The counsellor-in-chief of Chu, Zichang 子常, desired the same precious fur coat as the one Duke Zhao had presented to the king of Chu, and as the duke wore himself. When Duke Zhao refused, Zichang infamized the Duke with the king of Chu, so that the latter detained Duke Zhao. Only when the Duke gave away the fur coat to the counsellor, he was set free. Back home, Duke Zhao asked the duke of Jin 晉 for assistance in a revenge campaign against Chu. Chu, on its side, attacked Cai after Jin had occupied the territory of Shen 沈. Duke Zhao sent his son as a host to the state of Wu 吳, which, on its side, was to attack Chu. King Helü 闔閭 (r. 514-496 BCE) of Wu was indeed able to destroy the armies of Chu and to occupy Chu for a while. The revenge campaigns continued, and Duke Zhao again called for help by King Helü. King Helü, in order to have an easier game, ordered Duke Zhao to shift his residence more to the southeast, to Zhoulai 州來 (also called Xiacai 下蔡). The nobles of Cai were angry about the Duke's self-contained management of the state affairs and had him murdered. Duke Zhao was succeeded by his son, Duke Cheng 蔡成公 (r. 490-472). At that time Cai was not more than a vassal state of Wu. In 447 Chu finally destroyed Cai. 447 Cai destroyed by Chu 楚.
Shiji 史記, 35, Guan Cai shijia 管蔡世家.